When I found out that Kona-Lei, my favourite Hawaiian cocktail bar in Madrid, was closed I was really unhappy. But, in its place they opened, La Hummuseria, a vegetarian restaurant made for hummus fans (like me), so my sorrow didn’t last long. La Hummuseria is a very luminous and comfortable space with very nice waitresses willing to help you decide. 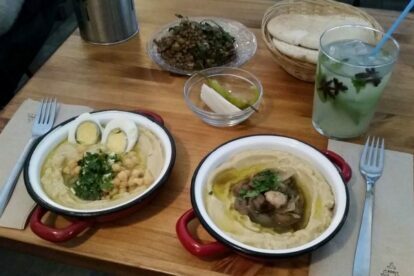 They offer several types of hummus: the classic version, with cooked mushrooms (my favourite), with almonds and pinions, with green tahini (with parsley) and the lemon macerated one. They will ask you if you want the hummus with boiled egg: say YES! The hummus is always freshly made, so it was the first time I tried warm hummus in my life, and it was great! Besides hummus, you can also order huge salads full of fresh and seasonal ingredients. And ‘tapas’ that change daily like ganoush, taboulé,…They have a € 9.50 menu on weekdays that includes a hummus plate, three small ‘tapas’, bread, drink and tea or coffee. And last but not least, I highly recommend you try their signature cocktail: homemade lemonade spiked with Ouzo, a typical anise from Greece. Delicious!! !